All I do is talk about Gundam and how much I love big operatic battles. My main issue with modern anime battles is how damn short they are. Gundam 00 was a series of anti-climatic battles, 1 minute battles. I’ve noticed that Unicorn begins with very fluid, well-done encounters, but uses a lot of cockpit shots and dialogue to lengthen the conclusive battles. Sometimes this is done to great effect, like the hostage negotiation in Episode 2, and other times it can come off as kind of corny and silly, like-with Banaghers idealistic screaming in episode 4. Unicorns status as a midquel seems to have forced Fukui to downplay the large-scale space battles. This was one of the reasons I found Muv-luv so refreshing. An entire episode of one large-scale battles, with very little cockpit-evangelising to stretch things out. When it comes to the kind of action choreography I want to see in modern anime I would point to the final episodes of Giant Robo. The whole thing is sprawling and large, constantly one-upping itself in set-pieces and characters-doing-batshit-insane-things, while never becoming confused or hard to follow. You could translate those scenes into live-action and they would stand beside, perhaps be superior to, the final set-pieces in modern blockbusters like Avengers of The Dark Knight Rises. That is a really good image I have to admit. From what I can sum up in LOGH, I thought that show is the anime version of those History Channel “WWII at Sea” documentaries where its all navel battles all the time for 140 hours because your old and the last thing you wanna do with your life is watch navel battles because you were there man. I could easily take those commercials and make an AMV with LOGH. But at the same time from what I saw, its a good show, and I couldn’t help but to be sucked into it. 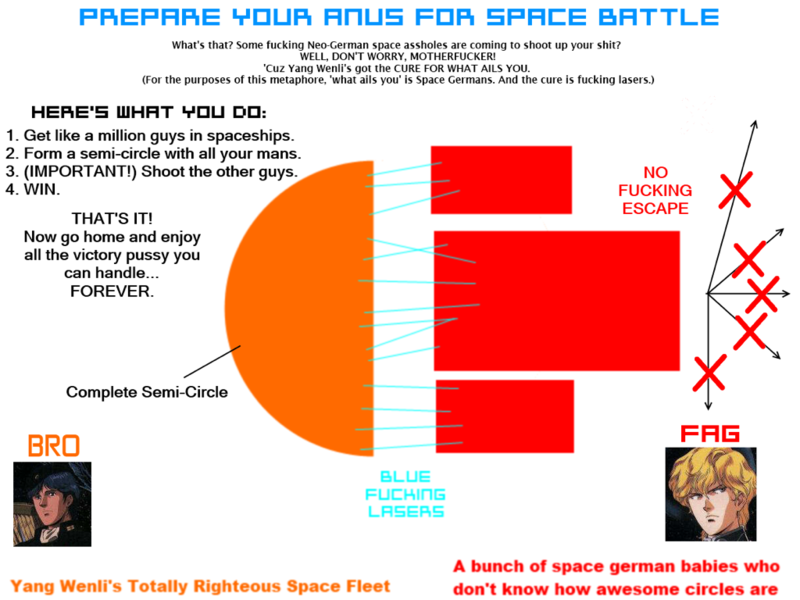 You are currently reading Episode 14: BIG SPACE BATTLES at Daily Anime Podcast.